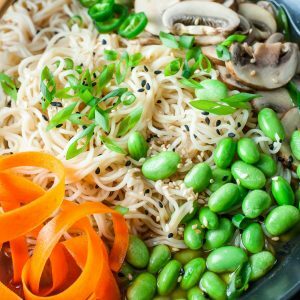 These healthy, hearty Vegan Ramen Bowls with Edamame and Mushrooms have an ultra quick trick for a super flavorful broth that tastes slow simmered in a fraction of the time! In a medium pot, bring water to a boil and cook ramen noodles per package instructions. Drain and rinse noodles with cool water and set aside. Bring the same pot (now empty) to medium-high heat with a TBSP of oil and sauté your garlic until fragrant and tender. Add half of your chopped green onion and all the chopped dried porcini mushrooms and cook for an additional minute. Add your broth, water, soy sauce, and Sriracha. Simmer, covered, on medium-low heat for 10 minutes. While the soup simmers, steam your edamame and prep your veggies. Feel free to add any extra veggies or toppings you'd like! Make your carrot ribbons by running a veggie peeler along your cleaned/peeled carrot lengthwise. I love the pop of color they give this broth bowl! At this point your broth should be fragrant and ready! Strain the broth through a mesh sieve/strainer and add back into the pot, removing the garlic bits to yield a clear broth. Give the broth a little taste and further season if/as desired. A little extra Sriracha will add heat while extra soy sauce will add saltiness and umami. Add your sliced baby portobello (cremini) mushrooms to the broth to soften until tender. If you prefer any of the other veggies softened versus raw (carrots and jalapeños for instance) you can absolutely add them to the broth until tender as well! This soup is crazy easy to customize. Divide your ramen between to 2-4 bowls and pour the broth and mushrooms over each bowl. Top with all your veggies, green onion, and sesame seeds and dive in! Extra noodles may absolutely be added if desired, but I stuck with 4 ounces to yield two brothy veggie bowls. Serving 4 soup-er sides? Extra noodles would be great or bulk up the bowls with extra veggies. Spice lovers can add extra sriracha to taste, or control the heat with crushed red pepper flakes if desired. The optional jalapeño topping will also add heat if you like your noodle bowl spiiiicy! I was in LOVE with the jalapeños on top of mine! See post below for more tasty topping options. Craving a burst of citrus? Feel free to dress scallions in a teeny drizzle of olive oil and a squeeze or two of lemon or lime juice for a light, citrusy topping for your soup!